We’ve got the wine, so how about a bite to go along with it? Our guest today has brought something better than a cheese tray…she brings us insight into Bite at First Sight! Welcome back Brooklyn Ann! Lexi: The last time we had you as our guest you had started your 20 stop blog tour and had finished writing Bite at First Sight. Do you have another whirlwind blog tour set up for this release? Brooklyn: I do! I'll be at Booklovin' Mamas, Reading Romance, Fantastic Fiction, Harlequin Junkie, and a bunch of other fun places! I'll also be doing a tweet chat with Fresh Fiction on April 28th at 11:30 central. I need to email them and find out whether that's AM or PM. Brooklyn: Well, I started the fourth book and wrote outlines for three more. Unfortunately, my publisher has decided not to continue this series. However, I WILL write and release at least book 4 sometime next year. Lenore and Rochester's situation was just too unresolved for me to leave that hanging. AND there are other series in the future. Lexi: I really do love my historical mixed up with some paranormal, and I am excited to check out Rafe’s story! A little bit of beauty and the beast in there? Rafe is scarred and disfigured and Cassandra is an intelligent woman not afraid to show off her brains? Brooklyn: You know, I didn't intentionally mean to draw a Beauty and the Beast parallel, I was more focusing on working with a more damaged hero whose very damage holds the key to the heroine simultaneously realizing her dreams and healing him, but I'm glad it happened. And instead of a library, he does give her an amazing laboratory. They also had a character dynamic that I'd never done before. Usually I have one serious character and one with a sense of humor. In this case both Rafe and Cassandra were very serious characters to begin with... yet somehow they brought out some humorous scenarios together. Honestly, Rafe laughed in this story far more than I'd anticipated. Also I did not expect the sexual chemistry between them to be as hot as it was. My fingers are still scorched from typing their scenes! Lexi: A great story line to go with some great characters. Which series characters are you currently more attached to? Your Scandals with Bite or the Brides of Prophecy? Brooklyn: I'm always the most attached to whichever characters I'm currently working on. And thus far I definitely don't have a preference for one series over another. There are things that I can get away with in a historic setting vs. modern setting, and the reverse also holds true. And now I have another series coming out soon where I focus on the world of heavy metal music. It's been an interesting new challenge given that there are no paranormal aspects, but a lot of fun. And don't worry, there WILL be more historicals forthcoming as well. Lexi: I think I will go attach myself, at least my eyes, to Rafe. Thanks for stopping by Brooklyn! Congrats on the release and be sure to stop by for the next one! Brooklyn: Thank you so much for having me! 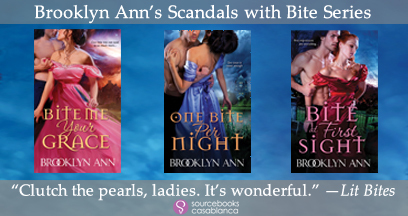 Don't miss the rest of the Scandals with Bite series! Lara Adrian has introduced some very hot Vamps! I can't wait to read the books in this series. I've sseen it aroud thh blogs and I'm looking forward to reading about Rafe. Thank you for the interview and the excerpt. There are so many. I love the vamps from Christine Feehans to Lara Adrians, Elizabeth Hunter,Kim Grosso and ETC. Rebecca Zanetti also has a good series that I like. 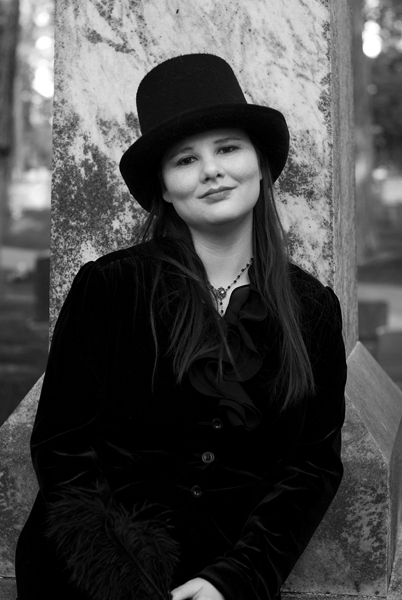 Well other then your vampires, Dianne Duvall has some awesome vampires. I love Rhage from the Black Dagger Brotherhood by JR Ward. I think mine will always be Eric Northman.